Samsung Group is a South Korean based company that was founded in 1938. Samsung has become one of the largest technology companies and their household appliances are making a big a presence here in the United States. 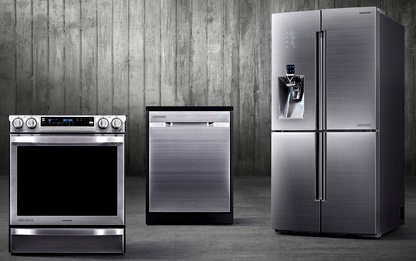 At Goodmans Appliance Repair we have the knowledge, training, and expertise to repair and service your Samsung Appliances. We know how diagnose and repair the most complex problem to the simple fix. Common problems we can help with are: dryer not drying or no heat. Washer leaking. Washer not draining or spinning. Refrigerator not cooling properly. Ice Maker not working. Frost build up in freezer. Dishwasher not working. 4E or 5E error code. We're here to help with your repair! Here's why to choose Goodmans Appliance Repair for all your Samsung Appliance Repair needs: Experience, Honest, Trained, Professional, Courteous, Insured. You're in Good Hands - Contact Us Today!